Yuepai established in 2006 is located in guangzhou the most developed economy area in china . Is has spacious working place workshops with advanced equipments and production lines with strict quality control system.Yuepai is able to provide one-stop oem service to customer like pattern designing-Model designing-printing-Clothing processing.Yuepai is the first digital printing enterprise who gained both the ISO 9001 international Quality certification and the ISO 14001 International Environmental certification among this industry. 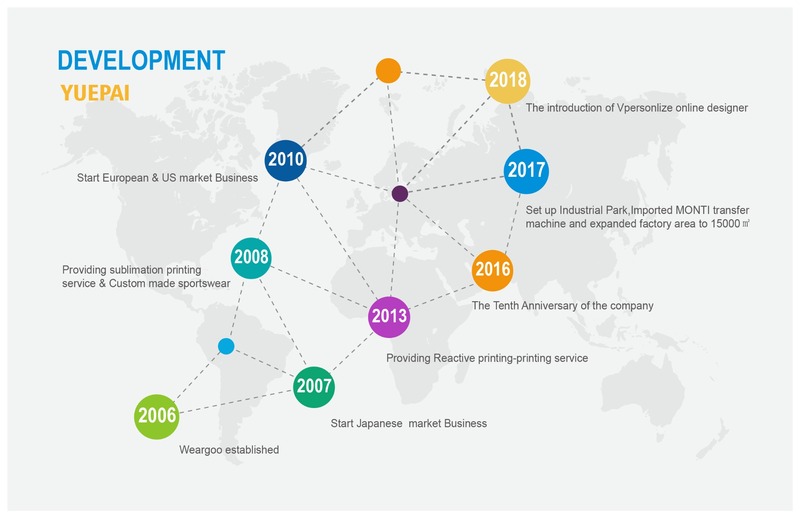 Meanwhile it's also certified by BV the top three authoritative certificated enterprise in the world .Since it's establishment,yuepai devotes to the R&D,Production and sales of disperse printing and reactive printing.Yuepai win high reputation in china domestic market and intermational market. 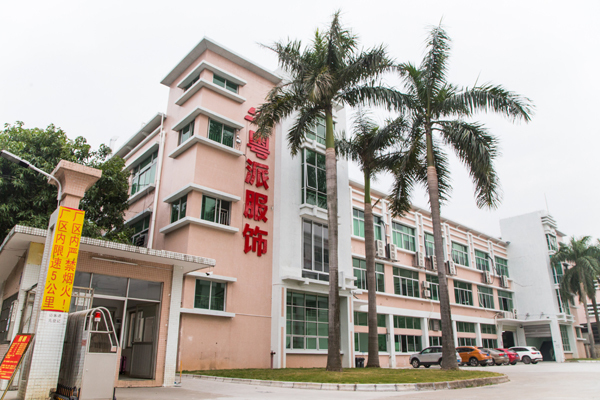 Yuepai has set up a clothing research institution in guangzhou gathering numbers of fashion designers all over the country .Clothing material are chosen by specialist and then comes to spot weaving and dyeing. 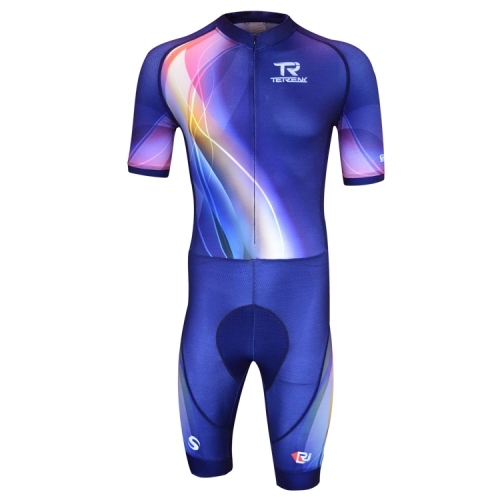 The high quality clothing material with flexibility breathability softnss collocated with the soft and delicate accessory under hundreds of processing creates the outstanding yuepai fashion. Each product presents the wisdom of yuepai's developmental engineers designers,process engineer and the humanity innovation and also reveals its motion and fluency completely .The solid and plump designing of the chest the natural compactness of the waist the smooth and proper waist-shoulder line all shese factors exhibit the fashion tastes and noble quality of yuepai. Yuepai,with the world's most advanced printing machines and professional printers is able to print the customer's design onto the fabric perfectly.The huge transfer machine also can transfer kinds of pattern onto variety of fiber fabrics by high temperature treatment.cutting with professional lasrt technology workshop work with constant temperature and humidity such condition allow yuepai to reduce the defective and dirty product greatly. Meanwhile yuepai has a number of MS reactive printing machine imported from Italy which can directly spray on the cotton linen silk and other nauraal fabrics. Yuepai imported Japan's advanced sewing equipment electric flat machine ,electric selvedge machine electric interlock machine and so on.From the precision trchnolngy to excellent details .yuepai already achieved the highly intelligent automation of designing,grading,layout and composing so as to meet the customers personalized demand.The digital printing process of yuepai mainly applies to silk contton and polyester and other clothing materials.Is owns the advantages of strong individuality various colorful pattern,no plating,and direct output .yuepai's printcloth has high precision,bright color and accurate pattern. 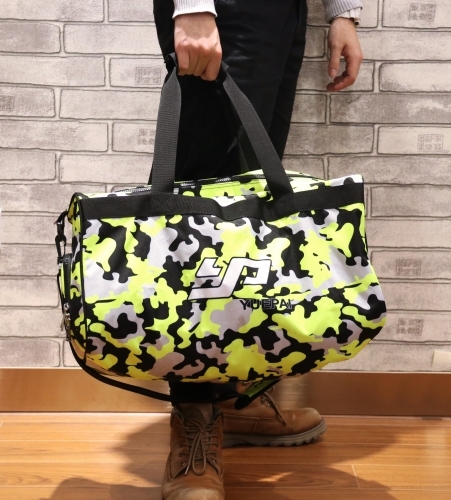 The integration of international economy and technology has shortened the distance between yuepai and international famous brand.In order to guarantee the printing quality from from source.yuepai imported the J-TECK high quality environmental dispersive ink and the HUNTSMAN reactive ink from ltaly. Which both passed the OEKO-THX STANDARD 100's testing and can be directly exposed onto skin that will not bring any harm to human body and also embody the people-oriented concept of yuepai. Yuepai established a set of ERP production management system for the production with informationlized management making the best use of manpower financial material information time space and other comprehensive resources.To achieve seamless connection strictly quality control to let customer feel more at ease. Yuepai is becoming the most influential brand in this field. With the reception of foreign trade orders the printing products of yuepai are also sold to overseas with great favor and welcome. Furthermore,with the best-selling record in Europ and America Japan Ausrtalia and other developed countries and regions .yuepai move forward to the international market steadily. Innovation is the essence of yuepai's marketing strategy regarded as the printing brand chasing for excellence each step shows the creation of its extraordinary achievement every innocation comes from the belief for higher quality.Yuepai team has nearly 10-year experiences of digital printing and sportswear manufacturing.leaging to create and serve the market best.The strategic meetings and professional training is the way to make yuepai team more professional and competitive. Learning is the best investment while training is the best welfare with high-end training system to ensure the continuous staff,demand for yuepai. Nawadays,the clothing digital printing has a wide market and yuepai's global brand plan makes.its influence and value increasing year by year. 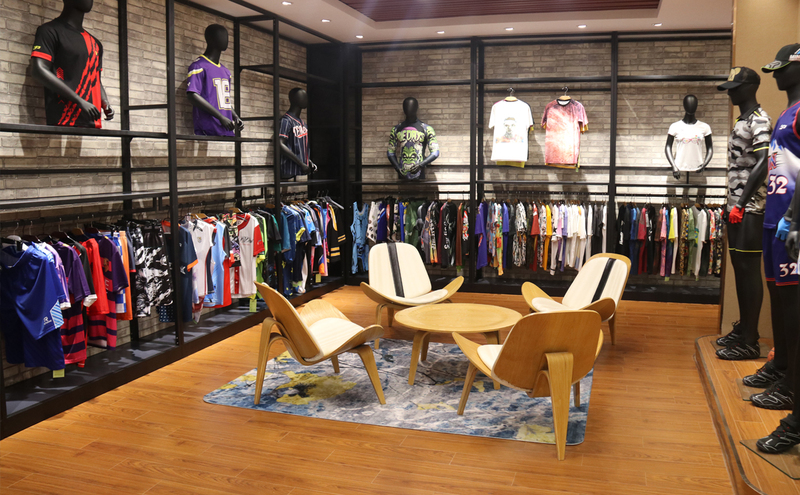 this common dream is to make every employee of yuepai gather together and take actions to express its spirit of fashion personality to create value for customers actively and help employees who adhere to the company's values to achieve their dreams. The global garment industry is become more coloful because of yuepai.